Odi et Amo: Weekend Update: Credenza Completed! Well, it took us two weekends, three coats of paint, one coat of polycrylic and a lot of elbow grease (and brass polish), but we finally managed to finish spiffing up the credenza I scored off of eBay last month for Dave's office. And despite this project being far more time consuming than I had initially anticipated, I'm pleased with the final results and consider it well worth the effort (especially given how little moola I ended up having to spend to get a look I am happy with!). We ended up selecting Valspar's Scarlet Sun in a high gloss finish. We didn't prime the credenza because it was already painted white, but I suspect if we had used a tinted primer we could've saved ourselves one of the coats of paint. Given the smooth surface of the piece (and despite lightly sanding the top), we also had some issues getting the paint to stick in the first two coats. This could have been solved by using an oil-based paint, which will stick to smooth surfaces more easily than latex, but we managed to get a pretty scratch-resistant surface by spraying a water-based polycrylic (in gloss) over the final coat. I decided to stick with the original hardware, primarily because it ended up being nearly impossible to find hardware that I liked that came in both 3-1/2 inch and 2-1/2 inch sizes (both of which are fairly non-standard as most hardware comes in 3 or 4-inch) and I didn't want to have to drill new holes (and fill the old ones). Unfortunately though, cleaning these babies up proved to be quite the task. We first soaked all the hardware in a salt and vinegar mixture for 30 minutes to an hour. After lightly cleaning them, we found that while this removed the first layer of tarnish, we still needed to go after them more seriously with a (very noxious, but highly effective) brass polish. Warning: the smell is seriously strong with this stuff, so if you use it, I'd work in a well-ventilated room (or outside) and take frequent breaks. The end result of our polishing isn't quite "like new", but I like how the hardware's patina preserves the piece's vintage-quality. A few more close-up shots. What I love most about this credenza are the details; the faux-bamboo lattice work on the center and edges and the campaign-style brass corners really elevate the credenza into a statement-worthy piece. Even better, now that Dave has ample storage for his many, many collections, we've freed up a ton of closet space, dumped the cheap-o plastic storage bins that used to occupy this space, and given him 6 feet of display room for his favorite geodes and fossils. These pieces will be joined by a pair of table lamps (yet to be purchased -- any budget-friendly suggestions?) and a few more pieces of art to fill the large wall above the credenza. I promise to post follow-up pictures once we get the area styled, but wanted to share the makeover with you now rather than later. How was your weekend? Did you get any projects completed off your "to do" list? WOW~! I totally love it Averill - great job! I love the color and all the details. That brass cleaning doesn't sound fun though - especially for me being pregnant. No thank you! But the end result was so worth it. Can't wait to see it in the room with the geods etc on it! How fun! We took the weekend off from our massive to-do list. Instead we had some friends over, and Matt worked on an important grant. Fingers crossed that he wins it! Hope to see you in NJ soon! 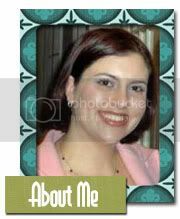 Any chance you're coming to NYC for BlogHer in August?!?! Wow! 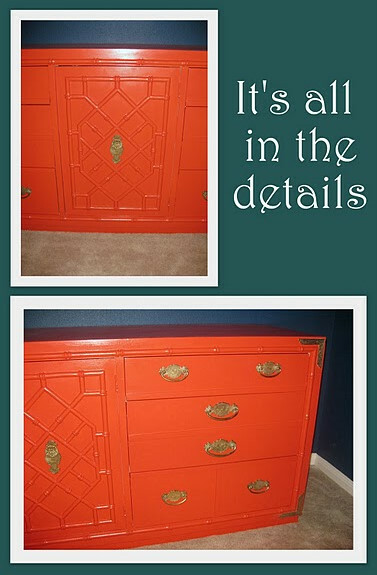 Great job - I love the color and the details on the credenza. You must be thrilled it's done! Congrats. I worked on pelmet boxes for my office this w/e. Will be posting soon! Wow, Aves! It's like...it's like night, and day-um! We bought a new house--finally!--so that's a pretty big one crossed off the "To Do" list. It looks wonderful! I can't wait to see it styled in the room. Love it! What a find!!! love, love it! the hue is just the right color for the make. I bet Dave was thrilled! MAGNIFIQUE! what a difference! I am sure you are happy with the ratio amount of work/result... Bravo! LOVE it, so warm and decorative. Your choice of color is perfect and yes, the details are exquisite. that is a show stopper! Great redo! You did a great job on this! I attempted a similar project two years ago with a dilapidated bedroom set I'd purchased, and it came out terribly. I guess I was impatient and inexperienced with DIY projects, and at least the task taught me some good lessons. My hardware wasn't standard sizes either, which would have been good to know before I got rid of it. Oh well, rookie errors! But yours came out extremely fabulous and you should be very proud of yourselves. Cannot wait to see it all styled up! WOW!!! She's a beauty! And she's orange! Be still my heart! What an amazing job!!! Go, Averill! What an incredible job. Totally inspiring! It's awesome!! I wish I'd known about those brass-polishing tips when I was working on my grandma's bureau. Maybe I would have been able to keep the original hardware. Aaah! It is SINGING with happiness over its new gorgeousness! Well done, Averill! I'm so glad you kept the original hardware - it looks amazing! I love the credenza! I'm jealous of both the credenza and the fact you got a project done. We got nothing done this weekend. Averill!! I knew you had it in you! I should commission you to come help with some of my pending repainting projects! I love that you worked so hard to preserve the hardware. I definitely agree it keeps it feeling vintage! I'm eager to see how it works with the rest of the room. Dave must be thrilled to have this much work surface AND storage AND such a cool looking piece! I'll keep it short. I LOVE IT!!! It turned out so well! I just love the detail on the center panel. What a great find. Isn't it so much more satisfying when you find a piece and update it rather than just buying some mass produced piece of furniture? What a great result! And enormous work! Well done! It looks absolutely amazing, Averill. You did a fabulous job! I have yet to work on a few home projects that I have in mind, but you've certainly inspired me to get on it! Just fabulous! Well done. I'm sending this to one of my girlfriends who found one of these in a thrift shop in Palm Beach. This should inspire her to ramp it up! Uh-mazing! My Protestant Irish immigrant grandparents would love it. They had a penchant for painting their whole world orange! oh my goodness you've outdone yourself! This turned out fantastic! Can't wait to see the final placement. Great job! Looks amazing -- great job! The color is perfect. Can't wait to see the whole office! Oooohhh! I LOVE it! So pretty! And the hardware looks fab. Glad you didn't change it. My sister just painted a similar piece kelly green. Bright colors bring such life to these pieces! Looks great. yay averill! thanks for the detailed paint information and all the close-ups. it looks gorgeous! Wow. What a big project! I spent about 9 hours DIYing over the weekend - and still didn't get finished. Great job! wow, love the color & details! Spectacular job Averill! I LOVE THIS COLOR. It's the perfect choice - you pulled off fresh and classic at the same time! It turned out so well. So amazing, it looks straight out of a magazine! Congrats!! Hi Averill, Just thought I would let you know I gave you a little "shout out" on my blog this morning :) After seeing this great piece, I was inspired to post my latest Craigslist find. That is SUCH a fabulous color! Love it! 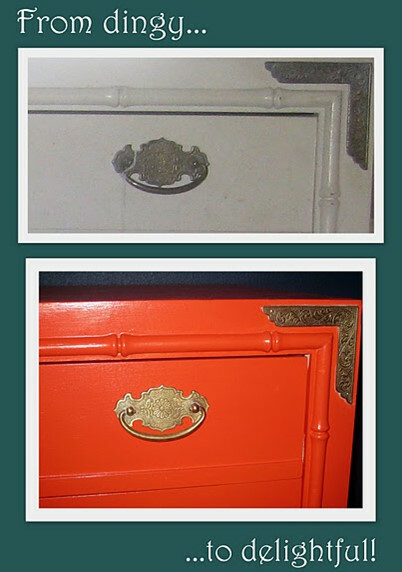 Brillant job on the cabinet -- wonderful color and great storage too! For very affordable lamps -- Target; Walmart (check online shop); Big Lots (really! LOL! ); Ikea; Homesense. Umm, I am totally going nuts over this!!!! Bamboo, orange and amazing brass hardware- I am in love!! I Love the color! What a great find, all of your hard work paid off! This looks amazing. I have to ask, did you use a brush? If yes did you have a hard time dealing with brush marks on the piece? I want to paint a few things, but I need them to have that super smooth finish that sometimes you don't get with a brush. Would love some more tips. Pemberley: I used a brush on the drawer-fronts but a small roller on the sides and top, which gave it a smoother finish than a brush could. I also sanded down and repainted any areas that showed obvious drips or brush marks. Ultimately though, if you want a super-smooth finish, I'd suggest getting a paint sprayer. I also finished with a spray-on polycrylic, which I do think achieved a super smooth sheen and help mask any brush strokes, etc. What an amazing transformation! Really impressive. Love your blog...always inspirational! 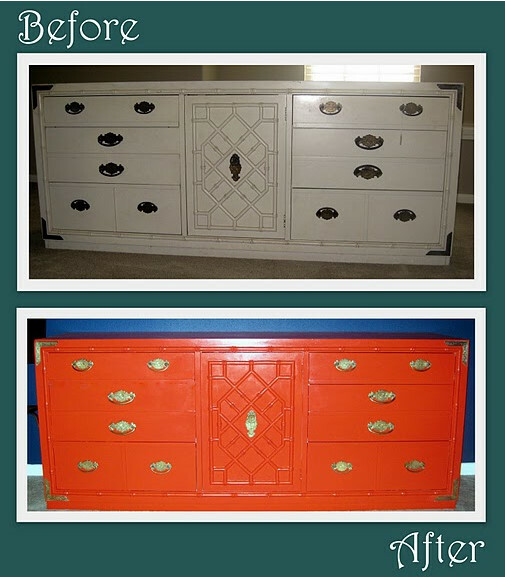 LOVE the color...have been toying with a similar color for our credenza makeover. Love the transformation. Great job.